The Cloud Native Landscape gives its viewers the impression of a vast garden teeming with a variety of projects, many of them in the same category, all coexisting harmoniously with one another. Yet the Cloud Native Computing Foundation’s move Wednesday morning to acquire stewardship of gRPC — the remote procedure call protocol for distributed systems — from its originators at Google, has resulted in the emergence of a six-tier assembly of inter-related components for distributed applications, that looks a lot more like a stack. “Essentially, gRPC is one of those pieces which helps with the microservices aspect of things, and there’s pretty tight integration between gRPC [and] the Kubernetes folks. There’s integration cooking between the open tracing community and gRPC,” Aniszczyk said. The gRPC protocol is a means for services staged on servers to establish communication with one another, to coordinate, exchange data, and share common data sources. The “RPC” part means what it always has: The remote procedure call has always been the trickiest part of distributed computing to pull off. Back before the web, the first attempts at distributed computing on a large scale involved architectures that involved sophisticated, centralized resources — or, in lieu of an omnipotent overlord, the replication of centralized resources across all participating servers. In the case of Microsoft’s Distributed Component Object Model (DCOM, its distributed version of Windows’ COM) in the early 1990s, there was a centralized registry, parts of which were shared among servers. It provided unique identities for specific components, and pointers to “type libraries” that catalogued all the functions that each component could perform. Developers invoked these type libraries with special #include macros in their source code, ensuring that all compiled applications were on the same page with one another. GRPC has much the same objective today as did DCOM, and the Common Object Request Broker (CORBA) before the turn of the century. What’s missing is the element Microsoft called marshaling: an overseer of operations upon which the success of the interaction solely depends. When the gRPC project began in 2015, Google cited this absence as a key advantage, freeing system architects to develop or utilize their own choices of methodologies for messaging. In the old days of distributed systems, the type library would have resolved these requests locally. However, the library needed to be installed locally as well. Imagine if every city published its own telephone directory, such that the only way to call someone in that city is if you owned a copy of it yourself. Eventually, you’d have a wall full of useless phone books… which pretty much describes what happened to the early RPC systems. GRPC resolves these issues through protocol-driven interaction. As Talwar explained it, the protocol enables services written using any language to negotiate with one another for common ground. Each negotiation leads to a strictly defined contract between components, ensuring that all exchanged data is of the expected type, and that handoffs are properly coordinated. Issues that a distributed systems developer might normally encounter, such as circuit breaking (preventing cascading failures), flow control, request cancellation, out-of-order receipt of message sequences (a common occurrence on web fabric), are all managed under-the-hood by gRPC, said Talwar. This not only negates the need for a regimental oversight component, he acknowledged, but also the impetus to build a custom message handler with every application — which the first hyperscale applications certainly did. Put another way, when microservices from disparate applications cohabit a platform, and none of these applications can bend their ears, if you will, to the same communications channel, it’s a security issue. So are these goals of manageability, policy application, and single-pane monitoring made more feasible if we stitch together this system — to borrow a phrase from Aniszczyk — around the Kubernetes container orchestration tool at the core? As an example, Talwar posited the creation of a container that hosts a gRPC service. It’s deployed on Kubernetes, but the wire-level communications between the containers in the system are handled by gRPC. Yes, it may be staged on Kubernetes, but the functionality here is completely decoupled. The purpose of a foundation created under the auspices of the Linux Foundation is to focus on a specific set of issues and how an open source component may address them. That’s how CNCF started, focused on orchestration. But as Aniszczyk reminded me, from the time of its founding, CNCF has had as its stated goal the aim of assembling the open source components that an organization may require to build a container application infrastructure. CNCF does appear to have already assembled a fairly complete stack. Besides gRPC and Kubernetes, there’s Fluentd for amassing disparate data sources into a unified logging layer; Linkerd as the service discovery component that replaces the need for a service registry database in distributed systems; Prometheus as the service monitoring platform (the first project after Kubernetes to join CNCF, last May); and OpenTracing as its workflow propagation management component. If you add Kubernetes’ CRI-O project to the mix, you bring container dispatch and deployment into the stack. The matter of container creation is left as an exercise for the developer. So despite the crowded shopping mall-like appearance that the Cloud Native Landscape presents, CNCF’s stack does look more like it’s selected its preferred “anchor stores.” Except that its leaders may wish we wouldn’t use that word. 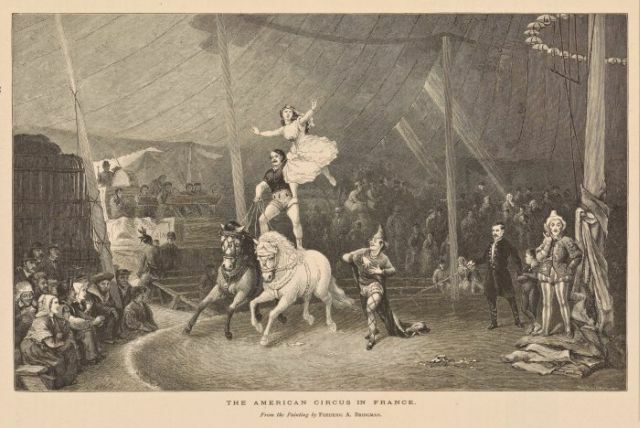 Feature image: An engraving based on a painting entitled “The American Circus in France” by Frederic Arthur Bridgman, from the Miriam and Ira D. Wallach Division of Art, Prints and Photographs: Print Collection, of the New York Public Library.